We had heard that Dahab is known as the 'Ko Samui of the Middle East.' Ko Samui is an island in the Gulf of Thailand that is somewhat legendary as a backpacker destination, where people end up chillaxing for days or weeks in cheap beach bungalows. I think it is underestimating Dahab to say it is equivalent to Ko Samui - Dahab might be better - its maybe half as busy, more like a larger-scale version of Nungwi in Zanzibar. In any case it is as close as one could come to creating an ideal backpacker destination. A waterfront location (think innumerable restaurants with huge pillow-laden booths, right at the water's edge), warm weather (and water), and most of all CHEAP, Dahab definitely exceeded our expectations...it is easy to see why people come for a few days and end up staying for weeks or more. We met folks who have been coming to Dahab for years and were on a first-name basis with the shopkeepers and some of the locals. It is just that kind of place, but of course we are not the first to arrive nor will we be the last...it seems the town is being developed at a pretty rapid pace and there is concern it will lose it's 'village' feeling and turn more into a resort destination like its neighbor to the south, Sharm el-Sheikh. But of course the main reason we were in Dahab was to complete our PADI Open Water Diver course, which would 'certify' us to scuba dive up to 18 meters at dive sites around the world. Unbeknownst to us, the Red Sea in Egypt has some of the best diving sites in the world, and is a big international center for diving. Not that we hit any of those sites as part of our course, but it gave us plenty of options for dive schools. We ended up going with Fantasea Diving, who gave us a great combined rate for the course and for our hotel. 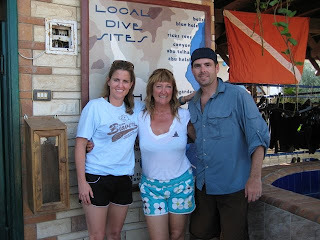 Our instructor Linda, from New Zealand but has lived in Dahab for 3 years, helped us complete the course in 3 days, over which we did a total of 9 dives. Mostly they were skill-based dives, performing tasks like maintaining your buoyancy underwater, removing & replacing your scuba mask and gear when on the bottom, and making emergency ascents using your partner's air supply. The last dive though was a completely free reef dive, with no skills or tests to complete. Overall the visibility was very clear, the water was warm, and we had no problem completing the course. Now we just need to schedule our next dive trip to keep our skills current. Since we had a flight to Luxor the day after our course, we stayed in Sharm el-Sheikh for one night. As we explored the much larger town of Sharm, we were happy we had decided to dive in Dahab as it seemed much more relaxing. Other than the couple hours on the bus, we spent much of the day making arrangements for our next adventure, a Nile cruise leaving from Luxor and ending in Aswan. After much consternation, somehow over email we managed to book a cruise leaving the very next day. In the evening we met a former colleague of mine from Accenture who is now a scuba instructor in Sharm - quite the career change! The following morning was an early wake-up call for the airport, we sadly had to leave the beach and head back to the desert.